8 posts categorized "Mayoral Ad-Hoc Development Process Review Committee"
Prepared a nifty little presentation on Digital Visualization for city planning and development at the request of Franklin's (deep breath) "Mayoral Ad Hoc Development Process Review Committee." Spousal negotiation to free up time for prep and presentation/discussion? CHECK. Quick tutorial by city engineer on how not to break the projector's $400 bulb? CHECK. Cool slides with bullet points and stuff? CHECK. In the age of cel phones, grown adults cannot call to say they won't be able to attend a meeting. So much for ambitious notions, proactive planning, grand plans and out-of-the-box thinking in Franklin, WI. Pack it up; go home. A monkey sits on a chair in front of a panel with two buttons. If the monkey presses button number one, they get one treat. Pressing button number two yields two treats. After participating in this experiment for some time and seeing consistent results, which button is the monkey likely to press? Our budget is tight, cutting services is difficult and so we need more revenue. The best way to get more revenue is by adding commercial development. We need more commercial development. Mr. Planner, zone more property for commercial development. Today we're not going to challenge that dead idea - although there are some fundamental flaws in the logic - but instead focus on the incentives that bring about this delusion. Here are my submitted agenda items for the Franklin Economic Development Commission meeting scheduled for Monday, April 26 (6pm; room to be announced). I'll post the agenda when it appears; unfortunately, there is no guarantee that any of these items will appear. 2) Franklin Trails Committee update: Walking Workshop and next steps. 3) Web 2.0 and Economic Development: Discussion of implementations to the City of Franklin website that can be made at little or no cost; discussion of FaceBook page for Franklin Economic Development news and issues; etc. 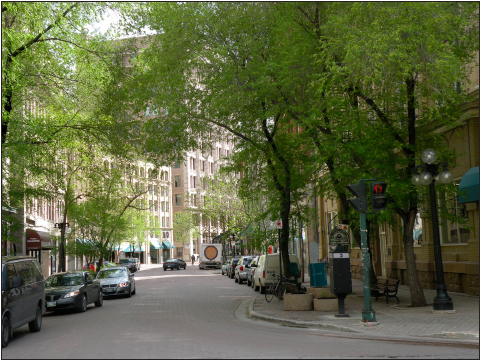 If we're going forward, reassess the streetscape planning and design to leverage new federal grant and funding opportunities that accompany certain design choices that I do NOT see in any current streetscape drafts. If the 27th Street reassessment means distributing a bunch of binders full of review information at this meeting and then holding the discussion at a subsequent meeting (after the EDC membership has had time to review the material), so be it. The ROI for smart growth and placemaking: "Love Ain’t Enough: Put Up or Shut Up"
Like any next, big something, placemaking is growing up. And in its role as gawky adolescent, it’s beginning to realize something most of us have long since come to accept: You can’t skirt by on youthful good looks forever. Today, efforts to create more endearing and enduring surroundings are being subjected to decidedly grown up demands. And with them, smart growthers—from enviros to designers to code reform advocates—are learning one of life’s hardest lessons: Love will only take you so far. Son, you’ve got to demonstrate sufficient returns. Recently, a city asked me for some help in their argument for funding transit oriented developments with TIFF dollars. The top arguments that immediately came to mind are the same reasons that cities are investing in planning and zoning reform, even during these tight times. City planning is able to speak to a variety of the significant challenges that currently face us. Here’s the soundbite version of the top 4 drivers. How do walkable neighbourhoods contribute to the local economy? They increase long term asset value for many reasons, including increased housing value, less crime, higher walkscore, lower vehicle miles traveled, less carbon emissions, fewer auto costs, greater personal fitness, decreased infrastructure cost, more hours available, real community, and the list goes on. What does obesity cost, and how is it effected by where I live? The average white male living in a compact community weighs 10 pounds less than his counterpart in a low density subdivision, according to the British Columbia School of Planning. Every 1% rise in the urban sprawl index increases the risk of obesity by 0.5%, according to Boston University School of Public Health. The medical costs to treat obesity in the US for 2008 is estimated at $147 billion. Where I live, we like our roads WIDE and FAST. Take, for example, the road pictured above -- posted at 25 mph and four lanes. Perhaps 30 cars per day travel on this road. Do you think they see the speed limit sign or the myriad factors that make this road feel ripe for 50-60 mph? That's design speed - a concept, I was surprised to learn, that a 17-year Plan Commission member in my city was unaware existed. Yes, POSTED SPEED and DESIGN SPEED are indeed two completely different things. If you live in a suburb, try driving the POSTED SPEED for a while and see how long it takes for cars to stack up behind you. And start using their horns. Forward-looking communities understand and control DESIGN SPEED, defined by the AASHTO Green Book as "the maximum safe speed that can be maintained over a specified section of highway when conditions are so favorable that the design features of the highway govern." In other words, it's the speed at which you feel safe driving on a given road due to it's width, sight-lines, lack of turns, etc. Unfortunately, the winding, wide roads in residential subdivisions encourage high-speed driving. And an enormously hazardous environment for kids and non-vehicular traffic (walkers and bikers). The new goal is to create roads that enforce a lower design speed. Toward that end, it's time to make sure local Plan Commissioners -- even multi-decade veterans who can quote the UDO from memory -- are made aware of the concept and begin to make recommendations to developers (like insisting on buildings close to the street when possible) that are consistent with the goal. New research from the University of Connecticut suggests that minor reductions in vehicle speed are possible through changes in the street environment. Through the use of roadside parking, tighter building setbacks, and more commercial land uses, road designers can make drivers subconsciously drive more slowly, according to a study of hundreds of roads in Connecticut. It’s a revelatory demonstration of the power of design to change the way people interact with transportation. Nevertheless, U.S. transportation engineers have generally ignored this European experience, focusing instead on “forgiving highways” that overcompensate for drivers’ mistakes through generous curve radii and wide lanes. Unfortunately, while these efforts have been successful in reducing fatalities on the high-speed Interstate system, they’re far less effective for urban situations, where they generally encourage drivers to go faster, putting more drivers, as well as bikers and pedestrians, in danger. Lowering the speed limit has rarely worked to reduce drivers’ speeds, especially for chronic speeders. The study also demonstrated conclusively that, compared to urban and other commercial environments, suburban neighborhoods had higher driving speeds — likely because of fewer distractions for drivers. Similar data showed that the further buildings were set back from the roadways, the faster drivers moved. In other words, the more built-up the environs of a road, the slower drivers went. So the conclusion is this: People can be induced to reduce their driving speeds when cars are parked along the roadways, when buildings are close to the street, and when those buildings include commercial rather than residential activity. Economic Development: With a budget stretched thin, how about PROCESS incentives? The Franklin Economic Development Commission spent a total of 30 minutes on Monday evening discussing possible incentives to commercial/business development the city. Unfortunately, no one present beside myself had attended the first meeting of the Ad Hoc Development Process Review Committee (the EDC representative to the ad hoc committee, Jim Kerr, was absent), so redundant specific process issues -- already addressed in a detailed plan staff proposal distributed at the Development Process Review Committee meeting -- dominated the early discussion. Given a city budget with no room for offering financial subsidies (and the fact that these subsidies tend to bite you back), I proposed taking advantage of the soon-to-be unveiled streamlined development process by offering PROCESS incentives to developers willing to meet certain yet-to-be-defined "Development Targets." The snarled knot of fishing line that represents our current development process makes it nearly impossible to offer any sort of process relief. In other words -- using yet another metaphor -- if you're facing a giant tangle of logs, removing any one of them arbitrarily can bring the whole mess down. However, once we have an orderly structure, choosing which fees, waiting periods, approvals, etc. to waive or minimize can be done effectively and to the advantage of the developer. As I noted when Franklin Automotive came to the EDC inquiring about possible incentives (see link for detailed explanation and graphics), there are opportunities early in the development process to improve poor site designs, unimaginative building plans, and to add other proven, market-friendly elements that spur further positive growth in the community. It's becoming clear, after all, that communities which can offer a diverse selection of neighborhoods, stores, businesses and public spaces are best weathering these tough economic times. I noted in this space how the city's leading developer, Mark Carstensen, remarked that as far as he was concerned, building a Traditional Neighborhood Development-type (TND) subdivision -- the kind that has seen big success in communities across the country -- is impossible in Franklin. In Mequon, however, his company encountered actual incentives to build a TND development, and he reports that everyone was pleased with the end product. So, I passed out the material below, explaining: We don't talk about process items; there's a committee doing that already (they meet again Thursday night at 5pm; in my chart I "greeked" sample process steps rather than try to attempt to illustrate the actual process). Instead, we leverage the impending improved system by finding a way to assess proposals early so the EDC can act as advocate for certain projects in its advisory capacity to the Common Council. No one agreed with me. Or disagreed with me - - - My materials (posted below) were not discussed. We adjourned after a total of 59 minutes. Somewhere, Thomas Edison shook his head in disbelief. 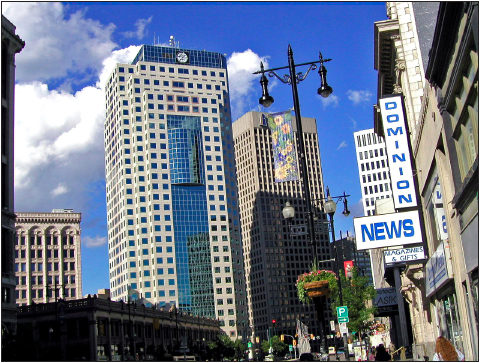 The developer as thwarted hero: Are suburban Unified Development Ordinances preventing sustainable, smart growth development? "We don't have that opportunity here." What a difference a little city support can make; two streets that are the same age but have totally different characters. ABOVE: A Franklin residential street. 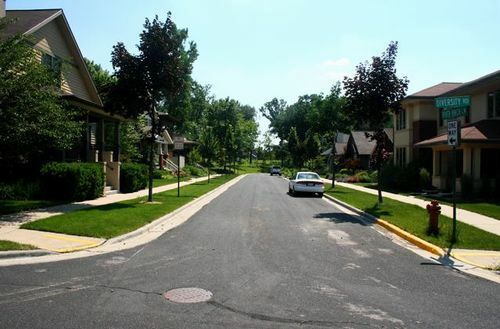 BELOW: A Traditional Neighborhood Development-type street in Middleton Hills, WI. Way back in June of 2007, I wrote a post that featured the pictures above, entitled Traditional Neighborhood Design (TND) in Franklin: Who Will Step Up? 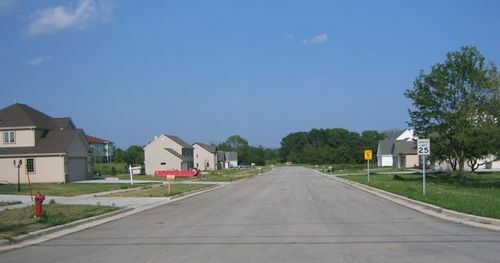 Franklin has room, opportunity and need for a TND development, yet we see bleak subdivision after bleak subdivision go up, accompanied by malformed commercial developments that serve vehicles and shun people. You can imagine, then, how my ears perked up at the first Mayoral Ad-Hoc Development Process Review Committee meeting this past Thursday, when I heard Franklin developer Mark Carstensen address some of the frustrations he faces in dealing with the city of Franklin's development process. He began by reminding the assembled that, when asked, Franklin residents regularly cite "rural character" as one of the elements of our city that they find important. But what do people mean by "rural character" or "rural feel"? Do people really understand what that term means? Versus the suburbs of Milwaukee County; what does it mean? Has it really been defined? Because it can mean a lot of different things; you throw out words that mean a lot of things to different people. For instance, we did a development up in Mequon a few years back that entertained the idea of clustered development. So they were rewarding developers to, let’s say that you were out in the areas that were not served by sewer yet, and the zoning would require that you could only have one unit per five acres. What the city did was they provided an avenue for the developers to come in and say, look, let’s say you have a tract of land 40 acres, 80 acres, what have you; the real goal here is to preserve green space, the real goal here is to preserve sensitive areas and so forth. If you show us you can condense the footprints of your lots, what we’ll do then is there’ll be a ratio we’ll give you for density. 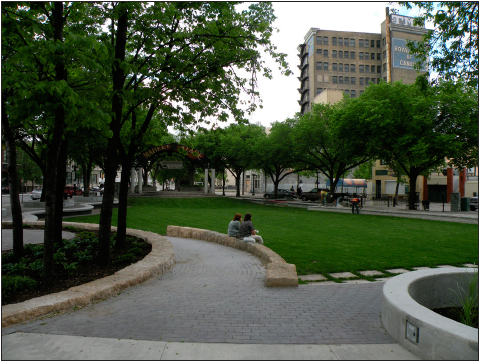 Therefor we were conserving more green space -- and everybody wins. So we did that. I think we had a 40-acre parcel property; by the time it was done, the lots themselves, there were seven lots on that development. I think the lots averaged an acre and a half. And the rest was left green space. Very easy. We don’t have that opportunity here. When you go through Franklin and you start adding all the disciplines where you can put retention basins, setback requirements from sensitive areas, landscaping ratios; and if you were to create a map to overlay all of these things, you would see that you’re burning up more land and getting less out of that land because we do have to also take a look at the tax base and revenues of the city. And as Randy [Plan Commissioner Randy Ritter, who has been on the commission for 17 years] is pushing for the "70/30" [the city's stated goal of balancing the tax burden at 70 percent residential, 30 percent commercial]; well, if the UDO [Unified Development Ordinance] is forcing you to use up more land to build less, I think it’s pretty easy to understand that you are going to leave what we would call a lot on the table, and not use your land that you can’t replace in the best possible manner and get the most out of it. C) A proven hometown developer sees, through personal experience, the economic upside to these sorts of high quality, smart growth developments -- which yield results consistent with the wishes of current residents and the desires of potential residents and businesses-- but plainly feels there is no effective mechanism in place in Franklin by which he can execute them. Franklin City Attorney Jesse Wesolowski immediately recognized that Carstensen was talking about Traditional Neighborhood Development -- a community design that has seen success across the country -- and pointed out that the concept has been included the Franklin UDO since 2003. Planned Development District: Traditional Neighborhood Development Intent. Proposed developments contemplated by an applicant to include design features described as “Traditional Neighborhood Development” in Wisconsin Statutes 66.1027 (1)(c), as amended, may be considered for approval as a “PDD Planned Development District” under the applicable procedures and standards described under Section 15-90208 of this Ordinance and at locations and with conditions determined appropriate by the Common Council with recommendation from the Plan Commission. The document identified as “A Model Ordinance for Traditional Neighborhood Development” dated April 2001 as published by the University of Wisconsin Extension pursuant to Wisconsin Statutes 66.1027(2), serves as the nonexclusive guidebook to assist in further defining the various aspects and elements of the for of URBAN design, along with such other sources of guidance the Plan Commission and Common Council may choose to consult. If a developer who has been building in Franklin for 30 years (and clearly has the ear of persons at every level of municipal government) is unaware of the very possibility of executing much-needed Traditional Neighborhood Development projects here, does that possibility even exist? At the November 23rd meeting of the Economic Development Commission, developers representing an expansion proposal by Franklin Automotive appeared before the Commission asking if there might be incentives or subsidies we could provide for their project. I suggested -- since I am largely against financial subsidies -- that their development be given priority and other process/application incentives in return for their re-visioning of their proposed mundane "multi-tenant buildings" as an amenity capable of adding value to the surrounding neighborhood. Unfortunately, all of the "new" EDC members were absent that evening; my proposal aroused no enthusiasm among the long-timers who were present. I'll try again at tomorrow night's EDC meeting ("Incentives" are again on the agenda) -- after all, I now have the words of Franklin's leading hometown developer to cite.